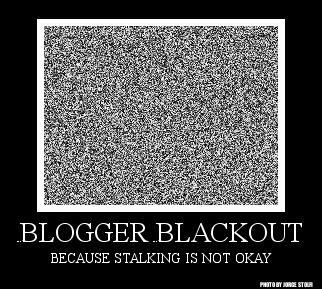 There’s been quite a bit of drama in the book review and blogging world this week and with that we’re choosing to join in the Blogger Blackout because stalking is not okay. Many larger review blogs have chosen to do blackout on reviews of new books and instead either post essays or encourage readers discussions. We’re going to participate in the blackout on new reviews and post reviews on older books. We got this idea from some of the discussion on Twitter between the bloggers. So look for some older book reviews over the next few days.